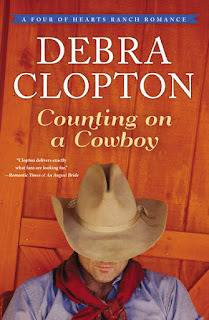 I was so excited when I found out I was chosen to Review Debra Clopton's Counting on a Cowboy! I LOVE THIS BOOK! Seriously, y'all....I couldn't put it down. I loved it. I read it in about 24 hours, I loved it that much. This book is book two of a series, but it really isn't necessary to read the first book first. You can easily catch on to the dynamics, thanks to the universal point of view. I always like to start with the first book in a series, so please feel free to do so! Debra Clopton weaves an intricate story line around 2 complete strangers who are both undergoing life changing events, that ultimately bring them both together. Abby Knight is a young, widowed woman who put the prospects of a family on hold in favor of her lucrative career. Tragedy strikes, and Abby is soon forced to reevaluate her life. She reads an article based on the town of Wishing Springs, Texas, and decides this quite little one-horse town is where she needs to go for a new start on life. Love is not even remotely on her radar. Abby gets a late start, and exhaustion mixed with the darkness and an escapee steer cause her to wreck through the fence of none other than Bo Monahan, one of the Monahan brothers from town and a most eligible bachelor. Due to injury to both herself and her car, and a weakness for the sight of blood, Abby is forced to rely more on Bo than she would like. Bo Monahan is your sterotypical cowboy hero....or is he? Bo is out in the middle of the road the night Abby wrecks. He is attempting to wrangle in the stubborn steer, and rushes to her rescue. She passes out in his arms, and he carries her home to clean her wounds and see to it she makes it to town safely. He is acting as chauffeur when he drives her back to his house once more and encounters and very, VERY unexpected surprise. Be had decided intimacy required real love, so he was content to remain abstinent as a result. But this thought was not present a year and a half earlier when he "went too far" with a girl he had only known for three weeks. This resulted in a pregnancy of which he knew nothing until he took Abby back to his home to check on his dad, and they discovered the baby (now 1 year old) had been left there with a note after the death of his mother. Long story short, Abby ends up saving Bo by helping him take care of the baby, and becoming the baby's nanny. This gives her new meaning in life, and helps heal her broken heart. Bo realizes not every newcomer to Wishing Springs has ulterior motives. And of course, they live happily ever after. There is a lot of back and forth inner turmoil in the book. Abby is dealing with strong emotional scars left from tragedy. Bo is reeling from an article his sister-in-law wrote that is bringing in ladies looking for husbands left and right. Abby was once a woman focused so much on her career that she put off having a family. This focus and the priority for a career led to an argument that took the life of her husband and unborn child (she didn't know she was pregnant.) While this sounds all together horribly tragic, she moves to wishing springs and gives up the fancy "city career" in favor of being the caretaker of a child who would be about the age hers would have been-and she is happier in Wishing Springs. While this seems innocent enough, I read between lines (maybe too much?) and kept getting the feeling that the book was trying to give the impression that women are happier at home, raising children, and taking care of their husbands. The resounding theme was she wanted a career and she lost everything she held dear to her because of that "selfish" want. I had a hard time with this concept, and it led to a "pet peeve" of sorts with an otherwise well written, and lovely book. There were episodes of addiction (alcohol and gambling) and the consequences of each, but overall I kept getting the "lesson" of women need to be home. Of course, I have a degree in sociology so I may read more into things that what are intended HAHA! The dynamics of Abby and Bo are a bit unrealistic. I can't imagine a scenario in today's time when two strangers could become so close in less than a week. This made it a little difficult for me to truly "get into" the story the way I could have if the time frame of actions had been drawn out a bit more. I really like the turn around on the stereotypical Cinderella story. Bo did rush in to try and save Abby when she wrecked, but she really saved the day by being able to take care of Levi. They both, more or less, rescued each other. I found it refreshing to read a romance novel that was not overloaded with graphic sexual references and foul language. I have never understood the need for such material in a book, and this book proves you can have a really good book with out all of that garbage. I am really looking forward to the next book in the series! Would you like the change to win not only a copy of Counting on a Cowboy, but also a $25 gift card, Horse shoe heart, and a western inspired bracelet? Well, if so, click below to enter for your chance to win! The contest will run until September 8th, and the winner will be announced on Debra's Blog on the 9th! Click below to enter the Love at the Reins Giveaway! 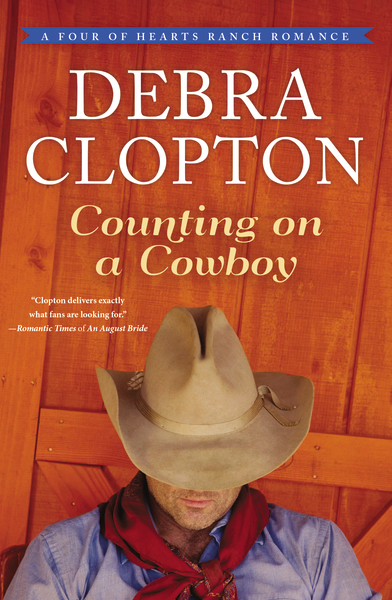 A new tale of romance, family, and taking risks—don't miss Debra Clopton's Counting on a Cowboy! After losing everything she held dear, Abby never wants to love again. But a certain cowboy may just spur her to wonder if love might be worth the risk. As Abby throws herself into helping Bo navigate fatherhood, hope sparks between them, revealing that maybe, just maybe, they can navigate their dark pasts and emerge together into a future as bright as the Texas sun itself. Enter today by clicking the icon below. But hurry, the giveaway ends on September 8th. The winner will be announced September 9th on Debra's blog.